Richard Soper Yeo was actually born in Lifton, Devon in 1844 before his parents, William Yeo & Grace Soper emigrated to Canada in 1847. 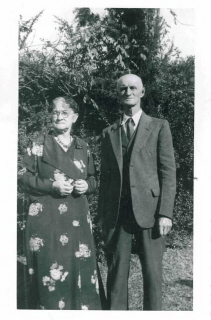 William & Grace settled in Staffa, Twp, Ontario and William was a farmer there. They had seven sons, John, William, Thomas, Isaac, Richard Soper (he died as a baby), Richard Soper, all born in Devon and Henry Soper who was born in 1851 in Staffa. They also had two daughters, Ellen & Emily. 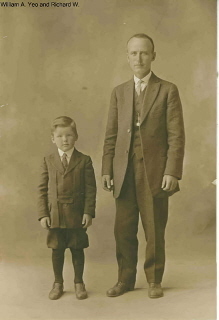 Richard was the only one of the sons to move from Canada to the USA, which he did in 1877 after his marriage to Esther Todd, initally they moved to Bradford Minesota and eventually they settled on a ranch near Ewartville, Washington. 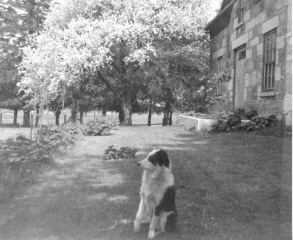 This snap was taken at the southside of the Stone House on The Bowman Home, Staffa, Ontario, May 1949. The Crab apple tree was in blossom and Short, the farm dog had a broken leg. 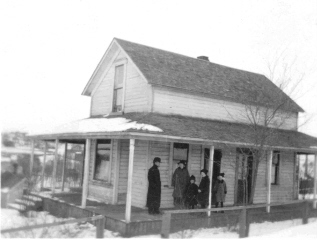 This was the Old Yeo Home, Lot 13, Concession 8, Hibbert Twp, Perth Co., Ontario, Canada. It was then occupied by Mr & Mrs Cecil Bowman. Mabel Bowman nee Yeo took the photograph. 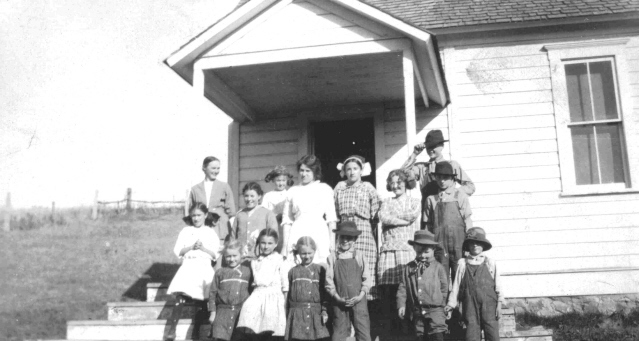 The Yeo school was built on land donated by Richard S. Yeo (I believe it was a corner of his farm land). According to a ledger kept by clerk, W. W. Kirkpatrick: "Miss Laura Crow [sister of Philena] was hired to teach a term of six months for the consideration of $40 per month." In an entry in a clerk's book for an old school prior to the new Yeo school being built the clerk writes, " October 3, 1887 drew warrant in favor of Miss Elsie Yeo for $25 dol." According to the article in the Bunchgrass Historian, Summer 1976, Elsie Yeo started the winter term for the newly established school district teaching for 3 months. On April 16, 1888, another session resumed with Miss Yeo serving as teacher for all eight grades. 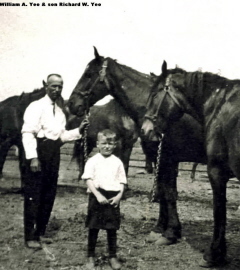 Richard & Esther's son only son William Alexander Yeo, took over the farm when his parents died. 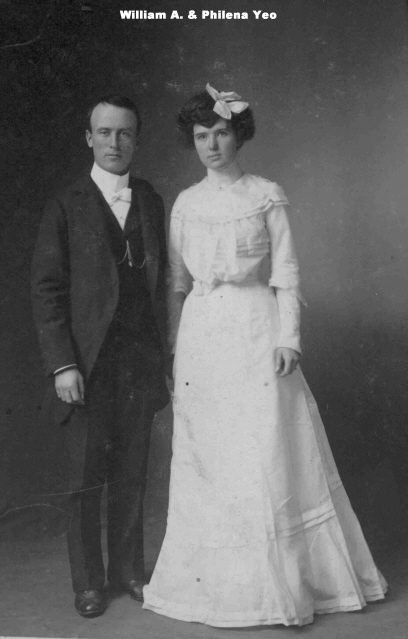 He was born 11 Oct 1871 in Allenford, Canada and married Philena Susan Crow 26 Nov 1902. Philena Crow is called Lena in the 1910 US Census of Whitman County, Washington. She died 28 Sep 1915 and is buried in the City Cemetery in Pullman, Whitman Co, WA. Her father was Richard Crow and mother, Sarah Jane Thrush. 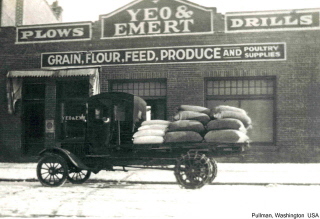 John Crow, Philena’s grandfather, was the Captain on the Bacon Wagon Train to Oregon from St. Charles, Missouri in the Spring of 1852 and reached Oregon in October 1852. 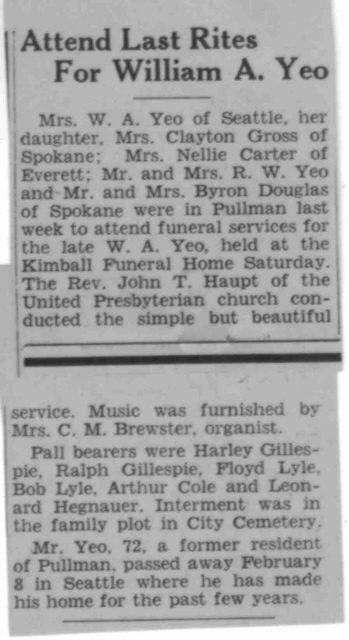 William and Philena had three children: Avis born 1904, Audrey M. Yeo born 21 March 1905 Whitman Co, WA and Richard William born 18th October, 1908. Avis married Oliver George in 1928, Audrey married 22 Sep 1929 Emil Victor Lindseth and Richard William married Helen Hegnauer in 1933. Philena died in 1915 and Richard then married Mary Snoddy in 1921 and they had a daughter called Grace who married Clayton Gross. This picture was taken when the Yeo family, William A., Richard, Avis, & Audrey took a cross country trip from Washington State to see family members in Florida. 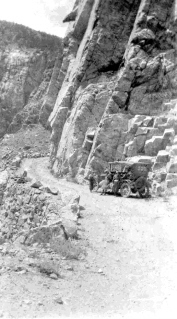 Quite an undertaking considering the road conditions in the early 1900's. 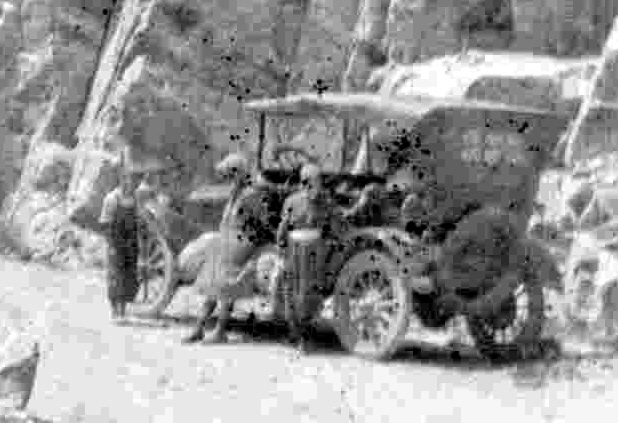 Bill tells me that the family had an article written about them making the trip and that one of the tires actually held up over the long trip. Heather Sue Yeo & Charles Wagner married 19 Jan. 1991 Thurmont, MD. William James Yeo & Melody Kennedy married 10 Oct. 1992 Georgia divorced 1995 William James Yeo & Gina M. Bellucci married 27 June 1998 Fairbanks, Alaska. 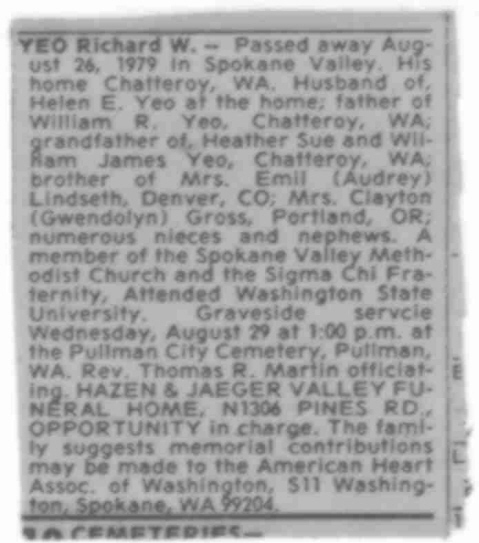 Richard W. Yeo's obituary, note that one of his sisters, Avis, was left out. Many thanks to Judith for sharing these beautiful family photographs and obituaries with us all. Judith would love to hear from any other descendants of Richard & Esther, especially those of Avis & Audrey as the families lost contact some time ago.